What reports do the different excel icons in Demand and Supply Planning generate? Each level of the planning hierarchy includes excel reports that can be downloaded to help facilitate planning. These reports are run either before or after a plan has been updated. Supply Plan: The Supply plan detail for the planned items. 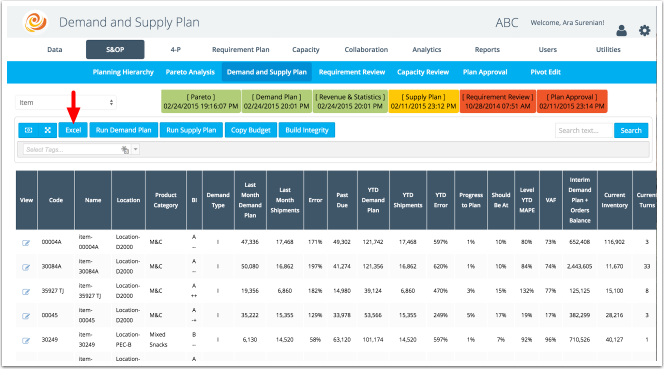 Next Fiscal Year Demand Plan: Downloads the Next Fiscal Year Demand Plan for the entire item that has been generated either statistically or over written as a user defined forecast at the current hierarchical level. 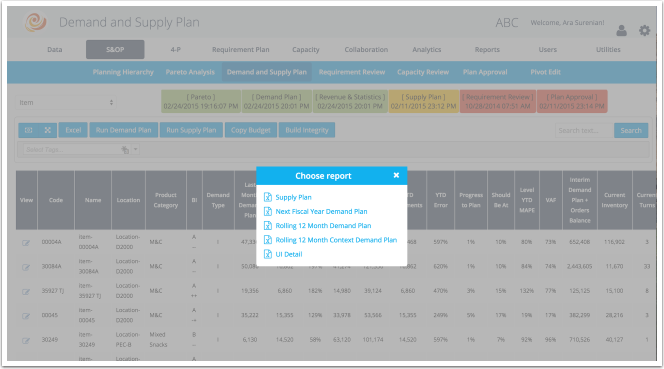 Rolling 12 Month Demand Plan: Downloads the Rolling 12 month demand plan for the entire item that has been generated either statistically or over written as a user defined forecast at the current hierarchical level. Rolling 12 Month Context Demand Plan: Downloads the demand plan for the context item (i.e. the demand plan of a specific item for a specific customer) that has been generated either statistically or over written as a user defined forecast at the current hierarchical level. This report may be edited and then altered to allow it to be re-uploaded to DemandCaster as described in the Downloaded, Editing, and Re-Uploading a Demand Plan article. Download UI Detail: Downloads the table data as shown in the interface. Each hierarchical level above the item level includes reports 4 and 5 only. When clicking on the UI Detail excel button, a pop-up opens up to allow the user to select the level to download in the excel report. When should the pareto be run? What Does the Past Due in the Demand Plan Represent? I have turned off forecasting an item within a customer, how do I prevent it from appearing in reports I download? Top Down, Bottom Up, or Middle Out? How are Revenue and ASP calculated? Why is the item history in the Demand Plan view different than the Requirement Plan view?